Notes from a Black First-Time Third Coaster. There still so many things I do not know. I am still teaching myself radio/audio lingo, still smiling and nodding, willing my eyes not to glaze over when veterans strike up conversations with me about equipment, technique, format, reach. And I haven’t quite figured out the stubborn resistance I feel to immersing myself in this culture. A year in, I still feel content in the wading pool; I may never deep-dive. I attended this year’s Third Coast International Audio Festival, in part to test that reticence and to challenge it. It was my attempt at immersion therapy: go, engage, become. 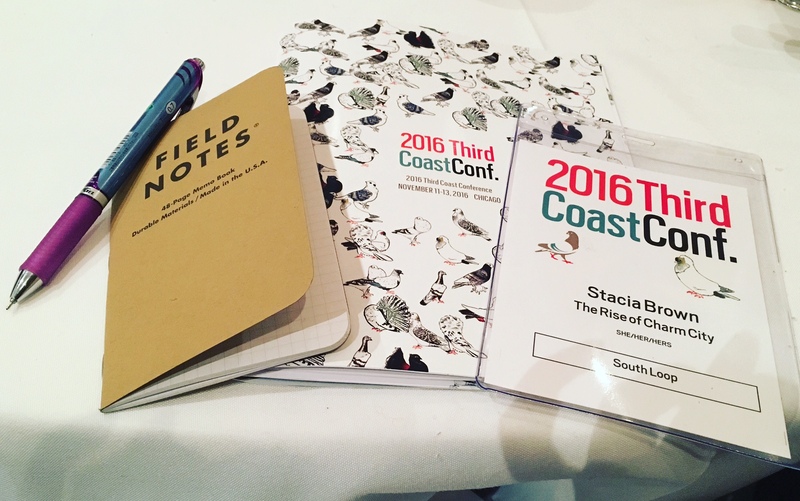 Third Coast was my last of five audio/public media conference/festival visits this year, but it was the first I attended as an off-duty participant. The others I was invited to by AIR as a panelist or presenter. I could tell that the vast majority of the crowd had long wanted to be there, felt affirmed by their presence among peers who wanted, largely, what they did. I quite enjoyed proximity to them, but I never felt like one of them, not fully. When you enter a professional field because you have won a competition, the experience of learning about that field is different than if you discover it of your own meandering accord. It is the difference between being set up on a blind date and meeting the love of your life spontaneously in the aisles of the bookstore or supermarket. The blind date may be a forever-match but there is often an element of doubt, borne simply of the particular circumstance. You are here because your presence was suggested and now it is up to you to decide if you are wanted or welcome. And it is also up to you to decide if you are desirous and welcoming. When I was making the first season of The Rise of Charm City, I was rapturous about the possibilities of public radio and podcasts. I was thoroughly enamored and this oblivious to the culture’s many flaws and challenges. I thought I knew them, anyway; public radio shares a boundary with print media — and I know its limitations well. In the few months since our first season wrapped, the rosiness of my new world has wilted a bit. This isn’t due to any artistic love lost. If I could, I’d devote copious time to producing and learning to produce deeply personal, high-concept projects. I’d do it to the neglect of other art/work-related things (and I have done a bit of that, if I’m being honest). My unmoored feelings have more to do with all that I still do not know and will have to teach myself and/or spend a great deal of money being taught, if I am to keep ambling down this professional path. And speaking of financial responsibility, I’ve had time to realize how closely an indie career in audio production resembles my experiences with freelance writing and adjuncting. Together, the three fields form a lovely fishtail braid but, depending on the month, they may not be able to feed me. Production is creative and inspiring and when I am among audio producers and employees at all levels of public media, I always get the sense that I am with people who wholeheartedly believe in the power of their work to guide the course of our culture. They are doing the arts work many public school districts have defunded. They are educating adults whose curiosity about life experiences other than their own is insatiable. I deeply admire that kind of social largesse. I contribute to it as much as I can. I am also always looking for ways for my daughter and I to live beyond the imminent possibility of personal financial collapse. So there’s a tension here. It always exists when I enter spaces of relative privilege. I rarely feel unwelcome — quite the opposite — but I do often feel that my presence — as a Black woman, deeply financially indebted to institutions of similar privilege, for the degrees they conferred, which grant me access to spaces like Third Coast in the first place — is fraught. I can’t seem to just go and abide and relish. I always feel like I’m in white professional spaces in response to something, to solve something, to contextualize something. I am there for all the people who can’t be, there to learn what I will now have an imperative to teach. And that — the constant awareness of it — is draining. What I know is that 700 people attended this conference this year and I didn’t have to search the room for people of color; they were all around me. I know that some of them — myself included — were there precisely because white people in positions of hiring and grant-funding power intentionally sought to bring them into the profession. And I know others were there without any institutional invitation; they are the door-kickers and the builders of their own infrastructures, solving representation problems without waiting for big media companies to even identify mis- and under-representation as problems. Public media is moving its needle. Third Coast, by extension seems to be working hard at a greater level of inclusivity. That should be acknowledged and appreciated. It is also still exclusive of a lot of the people it should include and we can’t stop pointing that out, either. Last year, I was tasked with creating a public media project that would reach audiences that public media does not typically reach. A year later, it’s difficult to measure how successful I’ve been at that. I am more confident that I produced work that represented that audience fairly and sought to avoid treating them merely as subjects on whom I’d report and to whom I’d never return. For me, that is just as important. And I can’t help but wonder if it would be, if I weren’t Black or a woman or a mother or someone who lives near, if not in, the communities I cover. As far as I can tell, public media still struggles with hovering over rather than drilling down. And there are many reasons for that, none of which are uncomplicated. (For more context on what I mean here, see the tweets below.) Podcasts, liberated as they are from some of the journalistic constraints of other public media outlets, can go a long way toward addressing that gap. If people of color can afford to produce them. If public media works both to invite and retain them. And if people like me are willing to leave the wading pool, willing to give the arranged date a real shot, rather than succumbing to the same disillusionment that prices and pushes us out of other fields of work and study. White pub media has covered communities of color forever and they way they do it, even if well-intentioned, is not the same as we'd do it. Audio docs are, of course, more expensive to produce than studio or conversational podcasts. They're labor/time-intensive, too. I've been to 2 confs this yr where clips of Black ppl's experiences have been played to a mostly white media audience to audible gasps. I guess I'm just saying in summation, sometimes you gotta scout and assign the reporter who isn't gonna gasp at a person's lived experience. An addendum: I was about two paragraphs from finishing this when news of Gwen Ifill’s passing broke. I’d be remiss if I didn’t say: black women have always been willing to pioneer these fraught spaces, to absorb the first wave, to stand firm while their white colleagues try and fail and try again to become truly inclusive, truly validating of our experience and what it brings to our reporting. I wouldn’t be able to have my angst-filled, lofty musings about my really expensive trip to an audio conference and what it means (or doesn’t mean for my professional future) without Gwen Ifill and all the women like her taking their rightful place in institutions that don’t always or immediately acknowledge that rightfulness at all. Love to her and hers — and safe passage. May we ever honor her invaluable contributions. → Sackcloth Farewell, Inauguration of Ashes.